Colordyne Technologies strives to offer unparalleled service and support for our digital color print solutions. Providing our customers with the right tools and services, Colordyne’s technical support team offers remote assistance, training, online demonstrations and more. Use those services and tools to increase your knowledge of color print applications. For support, call 1-262-317-7591 or email [email protected]. 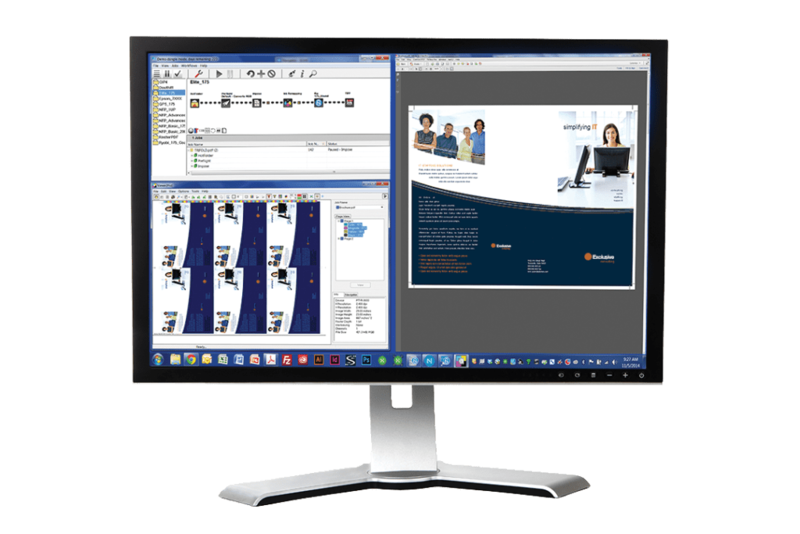 Across all of our digital printing platforms, Colordyne’s Control Software provides users with an intuitive user interface and the capability to easily control any and all printing applications. Colordyne 1600 Series users can take advantage of the intuitive print driver that allows users to save job set up information and adjust color settings on-the-fly to save time and eliminate waste in their labeling and packaging environment. The Colordyne Tool Box provides users with the ability to manage maintenance and monitor all actions on the device. Xitron’s® Navigator Harlequin RIP is a best-in-class implementation of Global Graphic’s Harlequin RIP. This technology is implemented across all of Colordyne’s digital printing platforms. Providing prepress operators with fast, predictable, and reliable interpretation of PostScript, PDF, and EPS format files, Navigator is the most trusted name in RIP architecture with over 30,000 installations worldwide. Variegator is a simple, stand-alone application that makes variable data printing quick and profitable. Variegator unlocks the power of our digital printing platforms to produce high profit variable data labels and packaging. Variegator gives you the tools to produce sophisticated data jobs with elements like variable barcodes, images and colors by dragging and dropping rather than writing complex code. For 3600 Series installations, Colordyne 3600 Track & Report software is available to monitor all functions of the 3600 Series. This software provides the operator instantaneous information in regards to consumable levels and system productivity. This valuable information also provides operators with the ability to forecast and project when consumable orders will need to be placed, eliminating the need to stock inventory for just-in-case situations. Colordyne Technologies offers technical support for both pre- and post-sale customers. 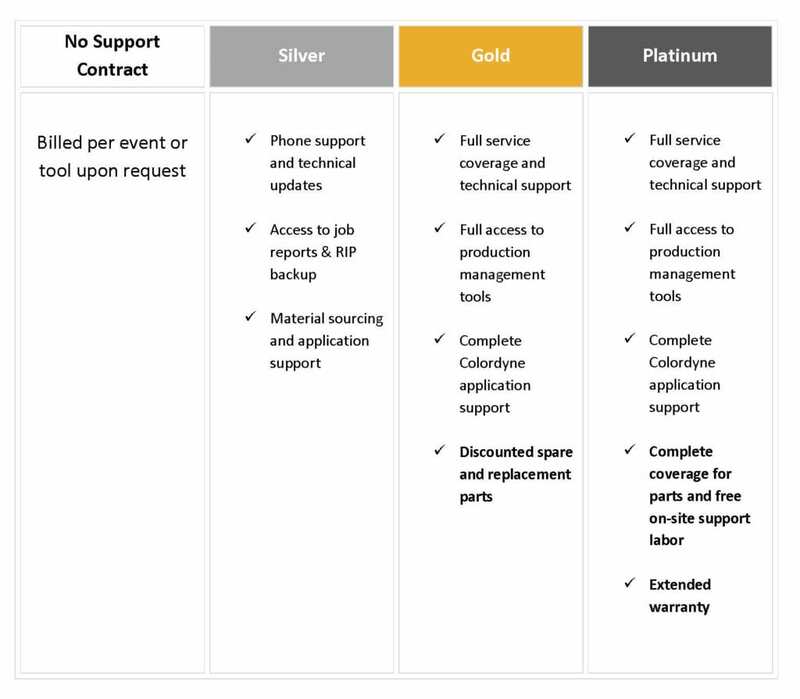 Support is provided through email, telephone, or Skype (colordyne.techsupport). For service and support plans and pricing information select the “Service Contract” tab above. Colordyne uses TeamViewer™ to connect to your PC/server to remote control as if we are sitting in the same office with you. Remote access allows us to install any necessary software or firmware to your computer, as well as provide on-demand technical support. This quick, on-the-spot solution lets us connect within seconds. We recommend that you download a copy of TeamViewer™ in advance of your call to expedite our support. Contact our technical support team to connect today! For our 2600 and 3600 Series users, training is included as a part of the on-site installation and set-up of your digital color label and tag press system. Training on the RIP and label design software tools is done for no-fee in Brookfield, Wisconsin. Colordyne also offers free ongoing training for 2600 and 3600 Series customers at our headquarters in Brookfield, Wisconsin. If you hired a new press operator, want to brush up on your skills or learn more about the different applications you can create with your Colordyne press, contact our support team at [email protected] or (262) 317-7591 today to schedule your on-site refresh. In order to ensure our partners are set up to be successful, Colordyne Technologies offers training in a few different flavors. For our Value-Added Resellers, Colordyne provides no-fee training done at our Brookfield office. This two-day course includes both technical training and education on the label design and RIP software tools. Additional training can be scheduled on-site or at our office for a fee. Some training can also be accomplished online using WebEx™. For more information on our training programs, please contact us at [email protected] or by calling 262-784-1932. Colordyne offers Customer Growth to our resellers and end user customers on fee basis. Although the products sold by Colordyne are designed with ease of use in mind, certain projects require the expertise of technicians who have extensive experience in the industry. Barcode labeling services such as label template design, label printing application, or integration are available. Click on the “Support Files” button for your printer to access the user guides, LED chart, manual, drivers and firmware. Colordyne Technologies’ technical support team is here to help you maintain the highest level of production quality and efficiency. If you are looking for support options on the 1600 Series platforms, contact our support team directly to learn about your support options. Email [email protected] for more information. For 2600 Series, 2800 Series or 3600 Series (single engine) customers, we offer tiered support contract options, ensuring we can provide each customer the exact level of support they need. Contact us today for more information about our service and support contract options and pricing. Colordyne Technologies is dedicated to providing innovative products backed by unparalleled service and support. Please submit the required information in the form below to ensure a timely and accurate response. Where did you purchase your Colordyne printer(s)? Why register your Colordyne printer? Registering your printer activates your warranty. Colordyne will periodically send you tech tips on how to get the best result from your Colordyne printer. Our technical support team will send you updates, including new drivers, updated firmware, and other equipment information. Technical service bulletins will be e-mailed to you directly. Fields indicated with an asterisk (*) are required. Please provide contact information for two persons at your company (a technical support contact and one other).